A full size toothbrush that folds into a compact travel size! The tri-fold design enables the brush head to fold into the handle, which then becomes a cover for clean and convenient storage in your pocket, purse, suitcase or backpack. 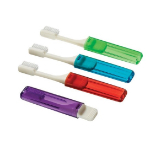 *Antibacterial properties are built into the bristles to inhibit bacterial growth. The antibacterial properties do not protect you against disease. As always, rinse your toothbrush after use.